Today just happened to be one of those super productive days. I completed the majority of my to-do list. I put together several weeks of new workouts. I need full body strength and a super strong core for my upcoming race season if I want to do my best and prevent injury. My boot campers and clients know, when I am on a mission and have a goal, I enthusiastically bring you all along for the ride. smile emoticon Fitness together is more fun! If you’d like to join me for one of my group classes, we are meeting every day this week at The Los Gatos Lodge @7AM & 9AM. Custom Fit Boot Camp is not just for runners. My workouts are designed for the “out of shape” just starting out, to the experienced athlete. It is an interval/circuit workout that combines body weight exercises, cardiovascular training, resistance training, and sports conditioning training that is physically challenging for your fitness level, uplifting, and fun. If this seems out of your comfort zone, trust me and give it try. I promise you will feel glad you did. Step OUT of Your Comfort Zone. I know that is easier said than done. The other thing I did today was to go back and forth on whether I should attend an upcoming course for speakers, writer’s and coaches. To accomplish something worthwhile, it will most likely require you to push yourself into areas where you are unfamiliar and uncomfortable. Usually, the more uncomfortable it makes you, the bigger the payoff. The funny thing is, that MOST people have the same EXACT fears as you do. BUT…it’s always the people that challenge themselves BEYOND their fear that become successful. Instead of looking at fear as a huge obstacle that gets in your way, embrace it. Whatever it is in your life that is holding you back, no matter how big or small it may seem, challenge yourself to break through the imaginary walls of your comfort zone. Don’t let life just “happen” to you. You HAVE the ability to CREATE your life the way you want it. Taking on new challenges and pushing yourself to reach new levels has EVERYTHING to do with your confidence in yourself and your abilities. When you’re feeling good, you want to take on the world. If you’re not eating a relatively healthy diet and exercising regularly, then this would be step #1. To be able to feel good and have the energy to live the life that YOU want to live, then these two things are non-negotiable. To let ANYTHING get in the way of stopping you from living the life you want is truly a shame. Whether it’s speaking in front of a group, making a phone call you’ve been wanting to make, repairing a relationship, or starting a new career, no matter how big or how small it may be…..
You only live once- let’s step it up and step OUT of your comfort zone. And…there is NO better time to start than NOW. I GUARANTEE you will be glad you did it. Let me know if you are committed to this challenge! Yesterday I ran a very happy 18 miles. I usually do not have a steak the night before a long run, but on Friday night I enjoyed a big steak. I believe I will do the same for my next long run and see how it goes. Flank steak is a great lean beef option for grilling, I make a quick rub and slice it thin across the grain just before eating. 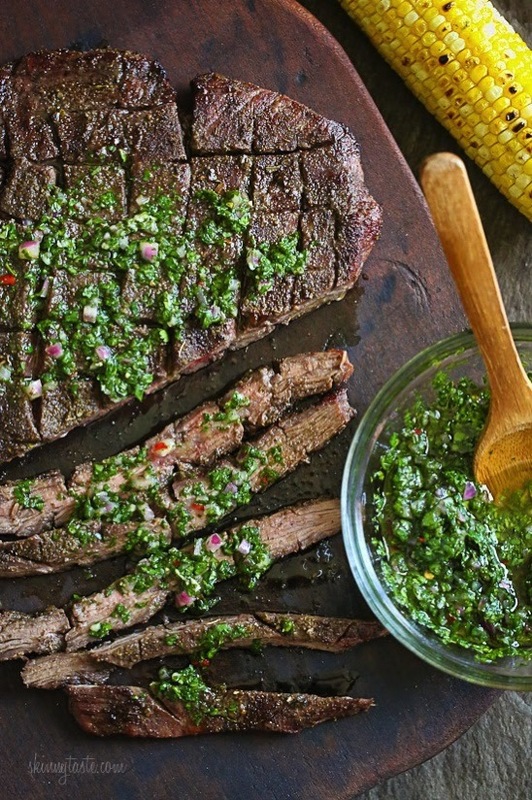 If you want to make the chimichurri sauce a day ahead, leave it refrigerated, then before serving bring it back to room temperature.